This Samsung microwave oven has 1000 watts of power and a 32 litre capacity. Its 318mm turntable diameter helps you defrost multiple pieces of frozen chicken. 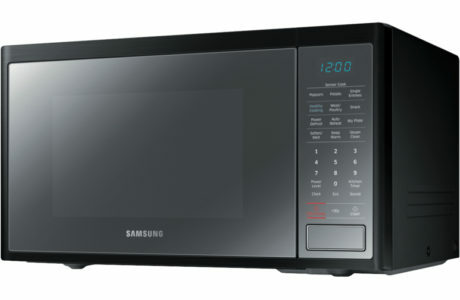 Choose preset heating and defrosting for a variety of foods with the Samsung Samsung 32L 1000W Microwave’s 0 cook menus. It has 318 defrost options, allowing you to evenly thaw meat. The microwave oven’s 10 power levels let you warm breads on a low-setting to maintain their moisture. And, make burn-free popcorn with its auto sensor. The Samsung 32L 1000W Microwave features a black finish. It has a 517mm width, a 297mm height, and a 384mm depth. Get dinner on the table fast with help from this Samsung microwave oven.